In December 2017. 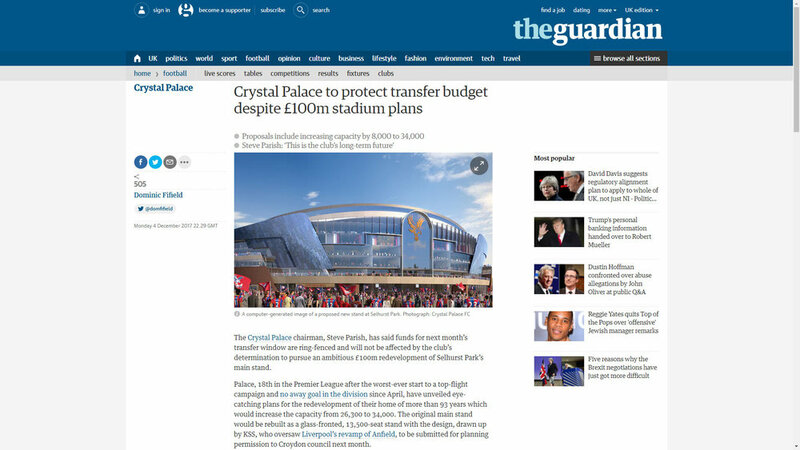 Crystal Palace Chairman Steve Parish unveiled ambitious plans to redevelop Selhurst Park, creating a new Crystal Palace for a new era. Preconstruct's CGIs, animations and VR experiences were the centrepiece of the press launch, showcasing the plans which are expected to cost between £75-£100m. Our images and online VR experience, spread like wildfire across the web and social media... BBC, Sky Sports, NBC Sports, ITV, Guardian, Telegraph, Daily Mail, The Mirror, Evening Standard. The redevelopment is centred around a stunning new five-storey stand featuring an all-glass front. Described as a homage to the club’s earliest days when it stood in the shadows of the original Crystal Palace, erected on Sydenham Hill. A central vaulted arch, with the famous Eagle crest, is a reminder of the iconic 1851 Exhibition Hall, and eagle wings flank the 41-metre structure. 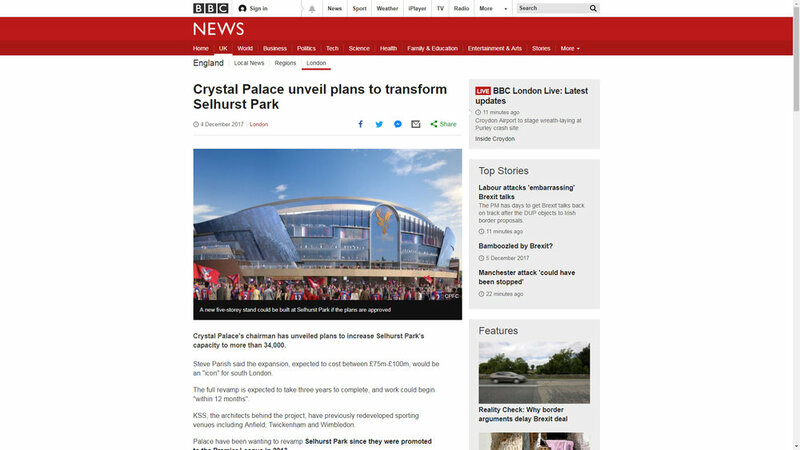 The project is being designed by leading stadium architects KSS, the firm behind the redevelopment of iconic sporting venues, including Anfield, Twickenham and Wimbledon. The roof of the new stand will be designed to funnel sound down to the pitch and the Arthur Wait Stand opposite. With a strikingly tight deadline for visuals, we made use of the 360 renders from our VR experience and turned them into this 90 second launch film.